If you have more questions, please let us know! 1. Inklingo is for hand piecers. Inklingo actually has more impact on methods for machine piecing and appliqué! Inklingo introduces new, simpler, easier methods of cutting and sewing. Machine piecers adapted traditional techniques when the rotary cutter was introduced in the 1980s, in order to compensate for not having a cutting line and stitching line marked on the fabric. The Inklingo Handbook describes new methods for sewing triangles, inset seams, appliqué, and combining hand and machine stitching (hybrid) for the best of both worlds. Inklingo is a return to a simpler time. Lines on the fabric make it easier for beginners to learn how to quilt. Some of the easy, new methods for sewing triangles are illustrated in the Triangle Tips PDF (free) under the Machine Piecing tab. Have a loook! 2. Inklingo uses special Inkjet ink. Any ordinary Inkjet printer or all-in-one with the regular ink. Really! The 20 colors of ink used by Inklingo are designed to wash out easily, or at least not to show in the finished quilt. 3. You can use Inklingo with the fabric in your stash. When fabric is ironed to ordinary freezer paper, it feeds through a printer just like paper. Every Inklingo layout is provided in 20 ink colors to show on most quilt fabrics. See how it works in "Printing with Inklingo" (the first chapter of The Inklingo Handbook, free download). 4. Inklingo works on PC and Mac. The first three Inklingo shape collections in 2006 and 2007 were on CD, and they require Windows 2000 or newer. All downloadable Inklingo shape collections work on PC or Mac computers. There is more info in the FAQ (Frequently Asked Questions) under the Support tab. 5. Inklingo costs a bit more, but it's worth it. You must be thinking of something else! Inklingo shape collections range from about $12 to $50, depending on the complexity and the number of shapes. Inklingo is inexpensive compared to acrylic templates, acrylic rulers, rubber stamps, and other quilting tools—and it does more. You also save the shipping when you download. Maybe you are confusing Inklingo with machines which cut shapes but don’t mark any lines on the fabric, and cost several hundred dollars. Inklingo does more and costs less! Cutting with Inklingo is faster and easier than using expensive shape cutters, and you get absolute precision with either scissors or a rotary cutter. Just cut on the lines! Faster, easier, simpler. 6. You draw the shapes. Inklingo shapes are already drawn for you, and provided in layouts which print the shapes on straight grain and use the fabric efficiently. Since they are PDF files, if you try to re-size the shapes, the seam allowances are also re-sized. There is an Index of Inklingo Shapes under the Support tab, with links to each shape collection. New shapes are added every few weeks. Let us know what you would like to see next! 7. The software is easy to install. FALSE, but this is a trick question. There is no software to install, easy or otherwise! Inklingo shape collections are PDF files which open with a free program called Adobe Reader (or Adobe Acrobat). Adobe Reader is included on almost all new computers, so there is nothing to install. Adobe Reader is a compact, free program, so if you don’t have it for some reason, you can download it from Adobe.com and install it in a couple of minutes. Downloading a PDF from the Inklingo web site is simpler and easier than installing new software. The instructions are under the Support tab. You save Inklingo PDFs on your hard drive, and do not need to be online to use them. There is a license agreement (EULA) for Inklingo PDFs. 8. Inklingo uses quite a bit of fabric, but it's worth it. This is another tricky one, so we have a two-part answer. 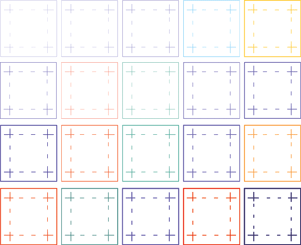 Inklingo layouts use fabric very efficiently. • The shapes are in layouts which minimize waste. Inklingo uses the same amount of fabric, or less fabric, than is required with traditional cutting methods. Combo layouts use fabric especially efficiently. 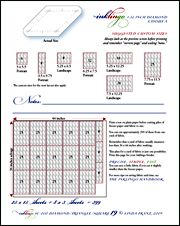 • Custom page sizes allow you to print on fabric as small as 3 x 5 inches. Inklingo quilters print pieces of fabric for exactly the number of shapes they need. • All Inklingo layouts are provided on 13 x 19 pages, to give you maximum flexibility, but normally we print fabric cut less than 8.5 inches wide, so it works with any ordinary Inkjet printer. 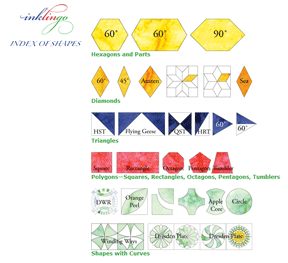 • There are suggested custom page sizes for each shape in the “Catalogue of Shapes” in each shape collection. • Since Inklingo layouts provide shapes on appropriate straight grain, and since there is no measuring required, mistakes are avoided, and that saves fabric too. Since Inklingo makes quilting easier and faster, you probably will make more quilts, and that uses quite a bit of fabric, so yes, "Inklingo uses quite a bit of fabric, but it's worth it!" 9. Inklingo works for scrappy quilts. Inklingo is ideal for scrappy quilts. You can print scraps as small as 3 x 5 inches, or Jelly Rolls, or odd scraps. Before Inklingo, I had no reason to print custom page sizes. It works with any ordinary Inkjet printer or all-in-one. All you have to do is enter the size in the print dialog box. It is very simple, but there is a step-by-step guide (under the Support tab) for your first time. Mary made this one and several more. Inklingo quilters love using up their scraps this way! BONUS See Mary's Inklingo Quilts on the All About Inklingo blog. 10. Traditional quilters don't use Inklingo. Many of the “traditional” methods which are taught today use weird rulers or complicated, wasteful methods to compensate for the lack of lines on the fabric. Today’s methods for flying geese and other blocks were developed to take advantage of the rotary cutter. Inklingo is better because you can use a rotary cutter AND have lines on the fabric. Inklingo takes us back to our quilting roots, before the rotary cutter, when quilters traced around cardboard or paper templates for stitching lines on the fabric. BONUS VIDEO Cutting tips on the All About Inklingo blog. 11. Inklingo = more time to sew. Preparation of the fabric shapes with Inklingo is faster and easier, so you spend more time sewing, and less time getting ready to sew. The rumor that Inklingo somehow lets you "add extra hours to your day" is false. It probably started because Inklingo quilters make quilts faster than anyone can with traditional methods. Even elaborate designs like Double Wedding Ring are more precise, simpler, and faster than with any other method. A pattern does not need approval to use Inklingo. Anyone can design patterns which use Inklingo in just the same way that anyone can design a pattern which uses a particular ruler or template. Inklingo is a tool. Also, any pre-Inklingo pattern which uses the same shapes can be used with Inklingo. Monkey’s Cheat Sheet (under the Support tab) makes it simple to summarize the shapes and sizes required. There is information for designers on the web site. Look under the tabs for Machine Piecing, Hand Piecing, and Appliqué. 13. Since it uses the computer, Inklingo is mainly for younger quilters. If you use a computer for e-mail or anything else, you know enough to use Inklingo. Several older quilters say they would not still be quilting if it were not for Inklingo. Inklingo lets you use scissors instead. —without all of the tedious prep. BONUS Your grandchildren might show more interest in learning to quilt if you show them how to get started on the computer. There are Inklingoists of all ages, not just geeks. Monkey says this lady would look happier if she could quilt with Inklingo. 14. You can finish an old UFO with Inklingo. You can mix fabric shapes which are prepared with Inklingo with shapes prepared with other methods. You can even finish an EPP GFG UFO (English Paper Piecing Grandmother’s Flower Garden UnFinished Object) with Inklingo! BONUS English Paper Piecing Rescue on the All About Inklingo blog. If EPP is the method you love, there are 8 Good Ways to Use Inklingo too. 15. You can fussy cut with Inklingo. You can see dozens and dozens of fussy cut POTC blocks from Lucy Boston Patchwork of the Crosses in the photo albums of the Inklingo Yahoo Group. There are TWO methods of Fussy Cutting with Inklingo—the traditional Swiss Cheese method with templates AND Inklingo No Waste Fussy Cutting (similar to Stack n Whack™. Try Inklingo now with the free shape collection! Before using any of this material for teaching or commercial purposes, please contact me.